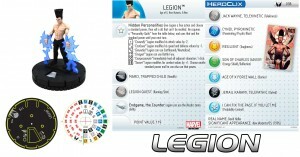 WizKids has another preview from the upcoming Wolverine and the X-Men set with a look at Legion. Welcome back as we X-amine another X-hilarating preview from the upcoming Marvel HeroClix: Wolverine and the X-Men! Today we bring you the architect of the Age of Apocalypse timeline as well as the unwitting creator of the Age of X alternate reality, the son of Professor Charles Xavier, Legion!